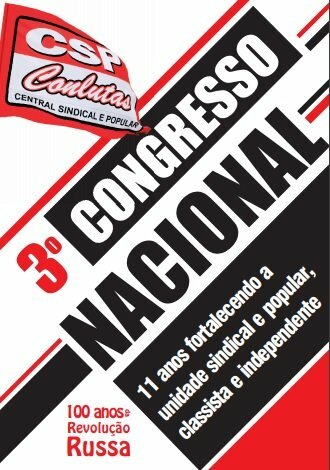 The CSP-Conlutas will hold its Third National Congress on October 12, 13, 14 and 15, 2017, in the city of Sumaré (80 km from São Paulo). In 2003, we began to organize a coordination of struggles, which was the embryo of our current trade union and popular central. Hundreds of representatives elected at workers’ assemblies across the country will attend the Congress. Representation of students, black movement, women’s movements, indigenous peoples, LGBTs, among others will also attend the Congress. It will also be present at the Congress workers who have been at the center of important social struggles in our country in recent years, resisting the neoliberal plans of bosses and governments. We are going to discuss the political and economic situation in Brazil and in the world, the struggles and organization necessary for the labor and social rights protection, and the strengthening of this united front organization of trade unions and popular movements as well as other allies of the Brazilian working class. We will also strengthen our relations with other friendly organizations and our internationalist vocation. Your presence will be very important to us. We would highly appreciate your attending to the Congress.